Inspired by pound cake, this blueberry cake has a tender, rich and buttery crumb. Jump to the Perfect Blueberry Cake Recipe or read on to see our tips for making it. 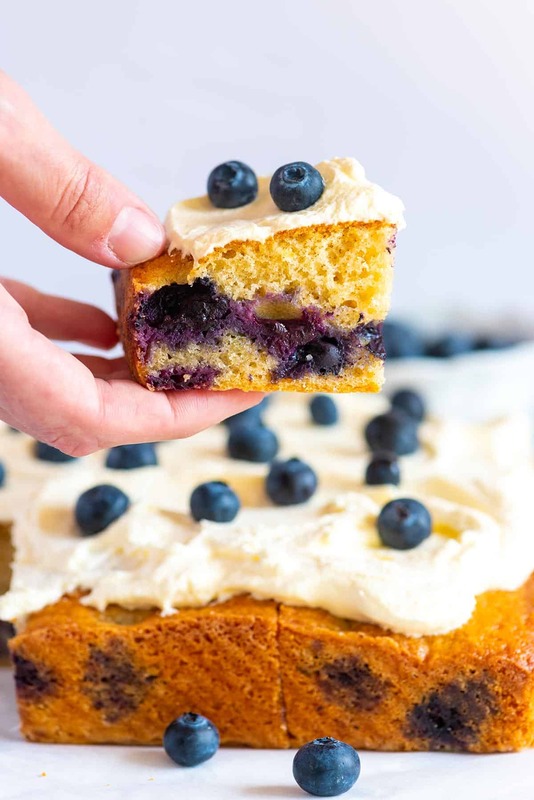 This blueberry cake is versatile. We love it with a dollop of whipped cream and extra fresh blueberries. It’s also lovely left plain and I don’t see any reason you couldn’t slather cream cheese frosting over the top. 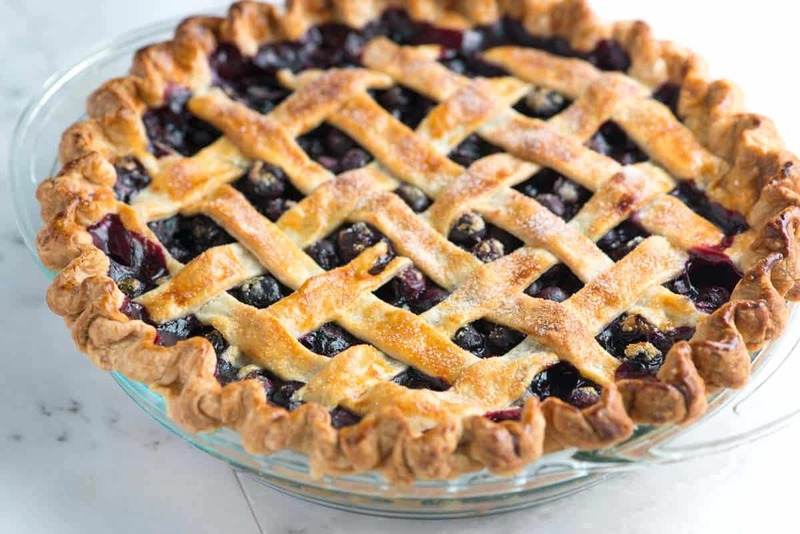 YOU MAY ALSO LIKE: If you love blueberry desserts, you must try our Easy Homemade Blueberry Pie. It’s summer in a slice. We add a touch of spice from allspice and cinnamon and zing from lemon zest. Since the cake has such a moist and tender crumb, it keeps very well. You can make it ahead of time without any issues. We’ve shared the process of storing and freezing in the notes section of the recipe (below). Let’s walk through the ingredients to see how they make this one of our favorite cake recipes on Inspired Taste. Melted butter: Instead of creaming softened butter with sugar, we went for melted butter. Swapping the softened butter for melted means the flour is coated with fat. This keeps water from mixing with the flour. When water and flour mix, gluten forms. So by preventing this, the cake turns out to be a bit more moist and tender. You can read more about preventing gluten formation in our pie crust recipe. Cinnamon, lemon zest, vanilla and almond extract: Nobody wants a flavorless cake. 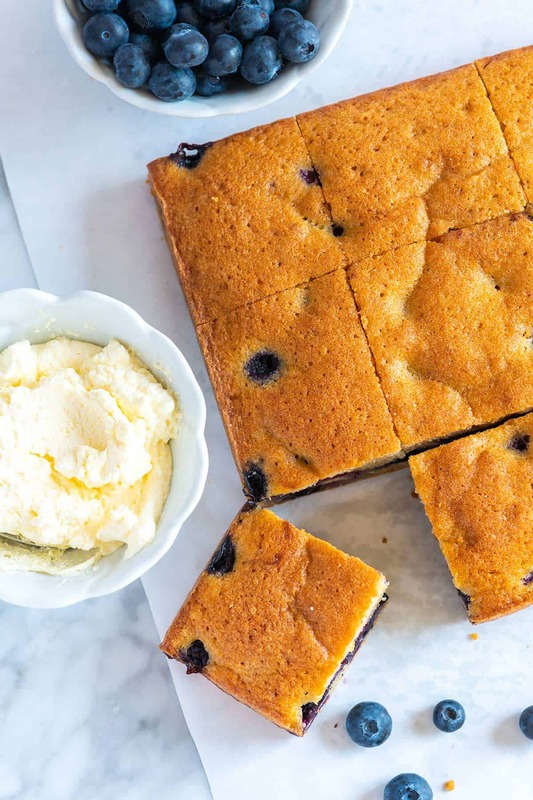 The batter for this blueberry cake has a bit of warmth from cinnamon and a little lift from lemon. The vanilla and almond extracts combine to make the cake taste like it stepped right out of a fancy bakery. Three large eggs: Eggs play an important role in cakes. Most importantly, they add structure and moisture. Three large eggs give the blueberry cake a tight-knit, tender and moist texture. Heavy cream: We wanted the texture of this blueberry cake to be more like the texture of pound cake. The added fat in heavy cream is one more step in making this cake flavorful, moist and tender. When it comes to making the cake, it’s easy! You don’t need any extra equipment, just a couple bowls, whisk and spatula or spoon. We bake the cake in an 8-inch-by-8-inch baking pan, but a tall walled round 8-inch or 9-inch cake pan will also work. For more blueberry recipes, take a look at these Easy Handheld Blueberry Pies, these Blueberry Lemon Cheesecake Bars, our Popular Blueberry Muffins and these Fresh Blueberry Mojitos! This blueberry cake recipe was inspired by pound cake. 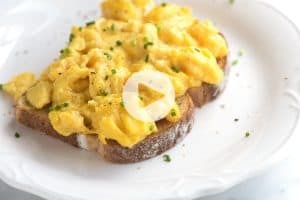 Thanks to melted butter, eggs and heavy cream, the texture is tight-knit, moist and very tender. We make this in a square baking pan, but a tall (at least 2 inches) round 8-inch or 9-inch cake pan will also work. 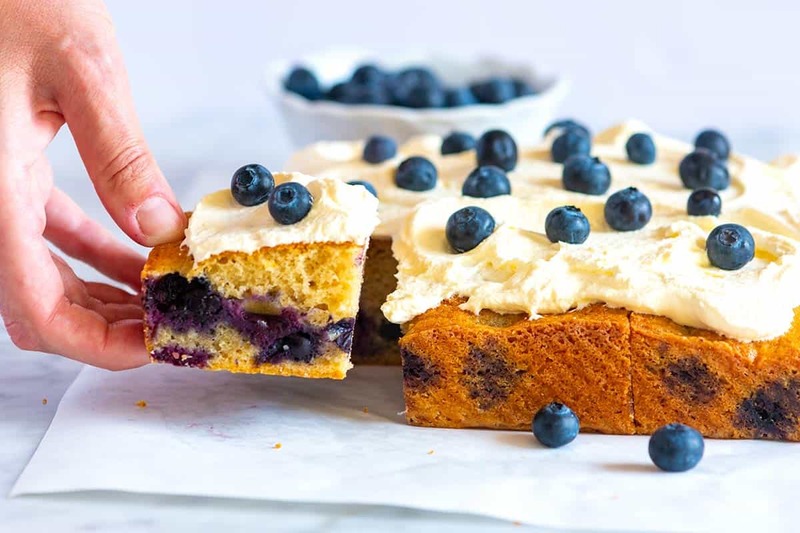 To minimize all the blueberries sinking to the bottom of the cake (some will anyway), we add plain batter without any blueberries added to the bottom of the baking pan first. Then we combine the blueberries with the remaining batter and spread on top of the first blueberry-free layer. Center a rack in the oven and heat to 350 degrees F. Butter and flour an 8-by 8-inch square pan. Place the pan on an insulated baking sheet or on two regular baking sheets stacked on top of the other (this helps even baking). 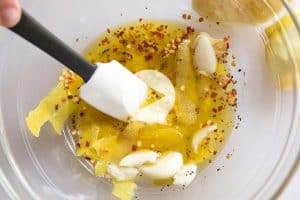 In a large bowl, rub the sugar, cinnamon, lemon zest, vanilla and almond extract together until the sugar is moist and fragrant. (We use our fingers to rub aromatics into the sugar.) Whisk in the eggs until blended then whisk in the cream. Switch to a large rubber spatula. Add the dry ingredients in 3 parts, stirring gently until they disappear and the batter is smooth. 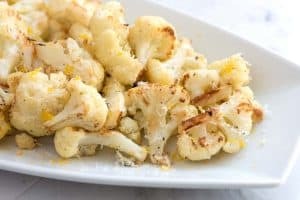 Fold in the melted butter in 2 parts. The batter will be smooth and thick. Spread about 1/3 of the batter in the bottom of the prepared baking pan. Fold in all but a handful of the blueberries to the remaining batter left in the bowl. Layer the blueberry-batter mixture on top of the batter already in the baking pan. Smooth the top then scatter remaining blueberries over the batter. Bake 50 to 60 minutes, or until a knife inserted into the center of the cake comes out clean. When baked, transfer the cake, in the pan, to a wire rack to cool for 5 minutes. Unmold the cake and place right side up on the rack. Cool completely before serving. Make-ahead and Storing: Bake the cake as directed and cool completely. Wrap the unfrosted cake tightly with plastic wrap or place into a resealable plastic bag. Keep at room temperature up to 5 days. If you have added whipped cream to the cake, cover with plastic wrap and refrigerate. Freezing the Cake: Bake the cake as directed and cool completely. Add to a baking sheet and freeze (uncovered) until hard, about 4 hours. When frozen, wrap tightly with plastic wrap then wrap again with foil. Freeze. Using Frozen Blueberries: You can use thawed and drained frozen blueberries for this recipe. To prevent the batter from turning greenish blue, try rinsing the thawed blueberries with water then patting dry. The nutrition facts provided below are estimates. We have used the USDA Supertracker recipe calculator to calculate approximate values. We did not include additional whipped cream in the calculations. For reference, 2 tablespoons of whipped cream is about 50 calories. Thanks so much for putting the grams etc.! I live in Amsterdam, so much easier this way. Made the blueberry cake already twice, delicious. 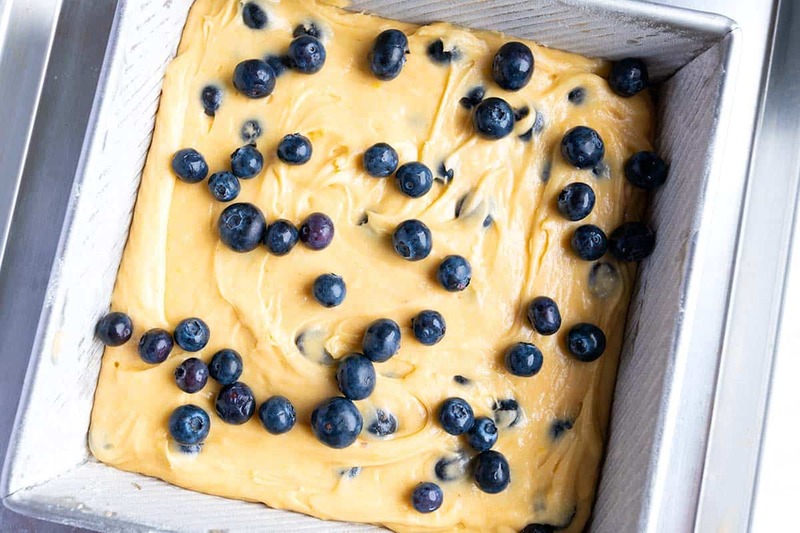 Even though you divide the batter in two, the blueberries sink to the bottom. Not a real problem. Yes, I have seen a very popular chef toss the blueberries with a dusting of flour so they do not fall to the bottom. Give it a try! Hi, can i use canned blueberries in syrup instead of fresh blueberries? Hi there, we have not done this ourselves, but we recommend removing the blueberries from the syrup before adding to the cake. Hi Eileen, We’re glad you love the flavor combinations. As for the substitutions, you may need to do some testing in your own kitchen since we have not tried them in ours. Greek yogurt should be a nice substitution for the cream and adding a banana for some of the butter should work well, too.